Evo & Grace: The WanderLusts: Balag at Angud: of Passion and Activism. 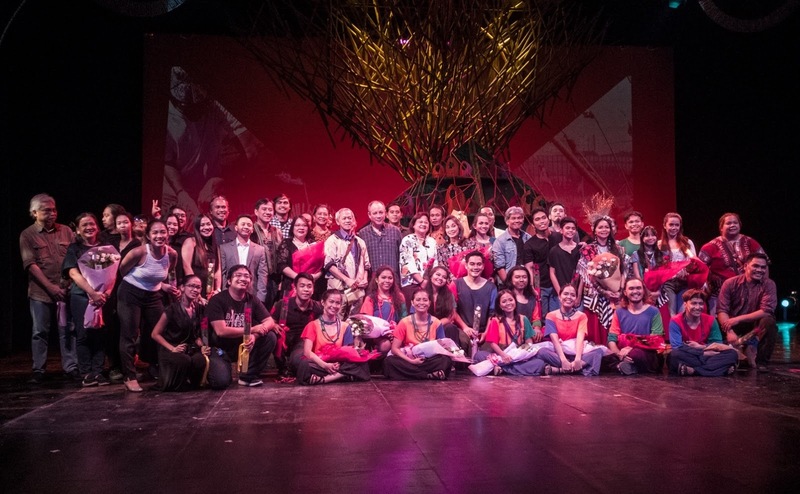 Based on the life of the remarkable contemporary installation artist, Junyee, Tanghalang Pilipino presents ‘Balag at Angud’. Playwright by Layeta Bucoy, the play takes the theatergoers through a journey of undying passion for the art and relentless struggles for standing on one’s principles. 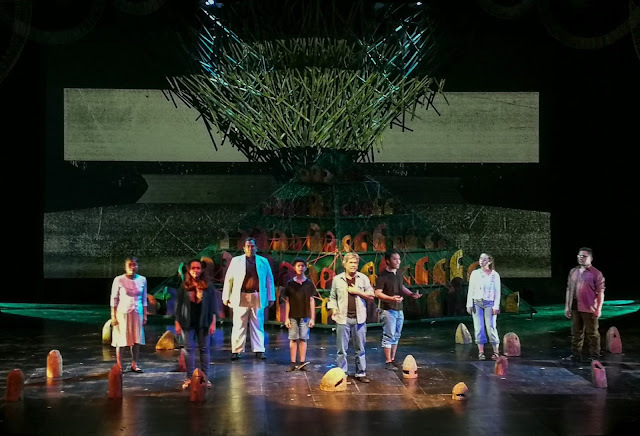 First staged in a university production, Bucoy’s playwright’s title came from Junyee’s two prominent art installations- all uses natural resources. Balag, a birthchild of the 70’s activism, is an installation of interwoven bamboo decorated with protest placards. Locally known as tree’s skull, Angud uses the collection of interconnected logged-trees remains- a protest against deforestation. 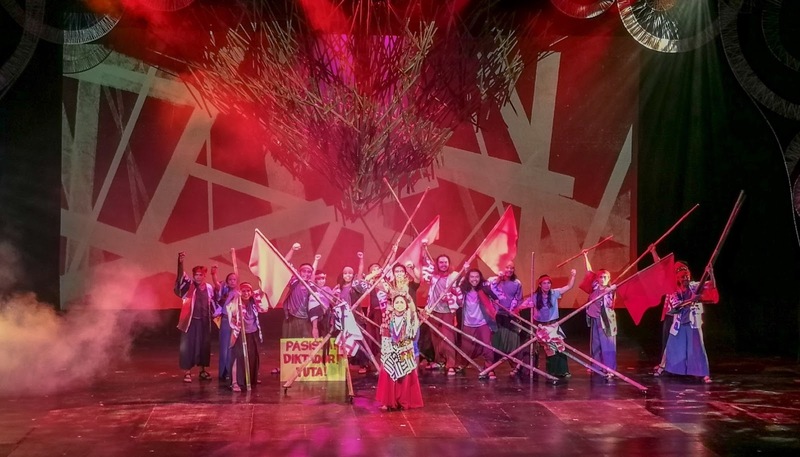 The play captures the colorful journey of Junyee’s artistry and passion enriched by music and songs that captures the spirit of journey of his life. The play started with a scene where Junyee fall into the floor after recognition of his work and the flashback commences with the appearance of his father’s apparition of doubtfulness. This brings back to his middle-class roots in their hometown as the heir to their family’s Palace hotel and where his fondness of creating art blossomed. He crafted installations from nature’s abundance such as wood branches and twigs as hotel’s ornamental pieces. Foregoing of having a stable life of being the heir of their family hotel and pursuing his passion for the art, Junyee fled his hometown in search for his life in art with a suitcase filled with his passion and his muse. His journey eventually landed him to attend UP Diliman and an apprenticeship with the National artist Napoleon Abueva. His passion for student activism sparks his participation for the rallies agains dictatorship in 70’s where his screams and disappointments gave birth to his protest art installation-Balag. His passion for interweaving art installation with social activism continues over the years and transcends plethora of social and environmental issues. His artistry is no walk in the park as the public’s appreciation and acceptance to his chosen craft is a challenge that he hurdles constantly. This challenge has peaked in 2007 when vandals destroyed his on-going installation in CCP grounds weeks before the showcase gala. With his own muse beside him, Junyee picked up his pieces as they ran into a mang-aangud- tree remnant pickers. The idea of collecting tree remnant as symbolism of its skull was formed as a protest to deforestation of the forest. His installation art “Angud”, interwoven remnants of logged-trees,was showcased in CCP in 2007. The play casts Rody Vera as Junyee. His singing prowess is at its finest with his effortless portrayal of the character. Paw Castillo’s acting as the young Junyee was exuberating the youthful passion and was exciting to watch. The life of the party as brought by the divine voice of the Musa Bayang Barrios. It was the excellent harmony of her unique timbre and the music that touches local ethnic sound that brings the play into the smooth grooves. It was also another great performance for Tanghalang Pilipino Talents. Jonathan Tadioan’s portrayal of Tatay Luis, Junyee’s father, was haunting and surreal. Ensemble comprised by Eunice Pacia, Monique Nellas, Joshua Tayco, Raflesia Bravo, Cheeno Macaraig, Sigrid Balbas, Karl Jingco, Cyril Balderama, Antonette Go, Lhorvie Nuevo and Aldo Vencilao brought the show alive with their production numbers that captures your senses. The production set gives justice to an artistry tribute to Junyee’s obra. Each installation was skillfully incorporated in each milestone in Junyee’s life accompanied with projections that takes this production a notch in artistry. Not knowing Junyee before the show, it was as if I had a front seat experience into both his life’s journey as well as a tour to his beautiful obras. The stage production and design were really a work of art. Toym Leon Imao, John Batalla and Datu Arellano did excellent in this play. To start with, the material was really great. The playwright’s pace may seem slow, but the phases of Junyee’s life that was captured was essential in building the concept of his struggles as an artist, the influences on his art and also the message that he wants conveys with his installations. I was captured on the first scene- an unusual victory scene of falling from podium after a recognition for a well-celebrated artist in his craft. The use of installations really sets the mood and brings sophisticated touch of artistry to each scene. From a very lively songs from the musa to the heartfelt ballads of Junyee and her wife, the accompaniment of the songs marries the narrative well. First show may not give you the best glimpse of the play, but overall it was a good experience of watching how passion can take your life into fulfillment. It was a journey of a genius of incomparable vision and artistry. 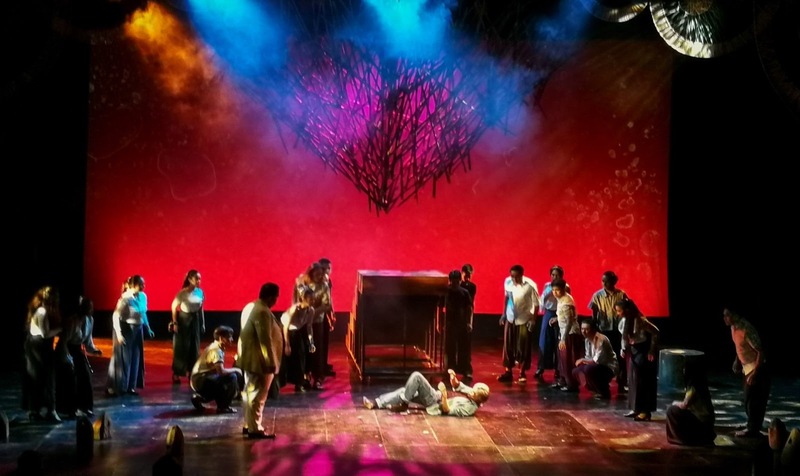 “Balag at Angud” will have its run from August 30 until September 16 at CCP’s Little Theater. Text and Photos by Arianne Dave Farnazo.